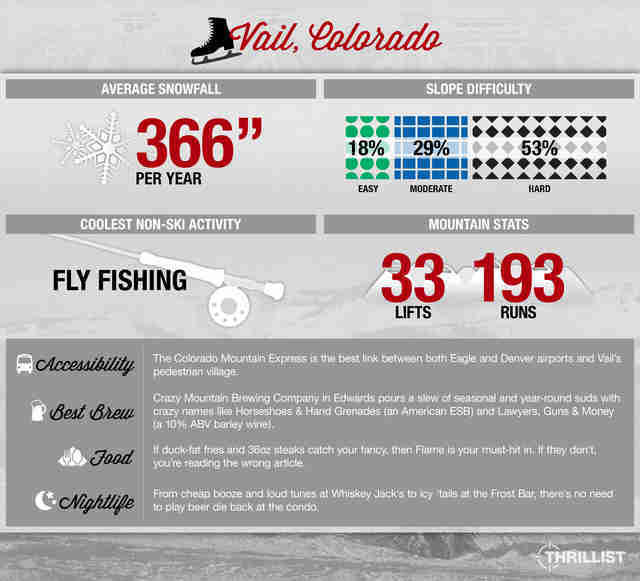 With 5,289 acres of total skiable terrain, Vail is one of the largest single-mountain ski resorts IN THE WORLD, and rocks three distinct areas -- the Front Side, Back Bowls, and Blue Sky Basin -- ensuring everyone's got a spot, and they can all play nice. 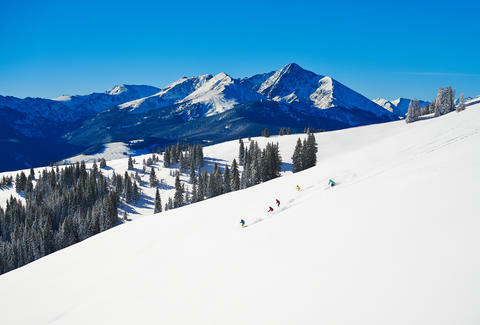 Despite its luxe, pampered rep, Vail's overall attitude is far from snobby. The Bavarian-style village -- with its pedestrian-friendly heated streets (sorry, did we say something about pampered? 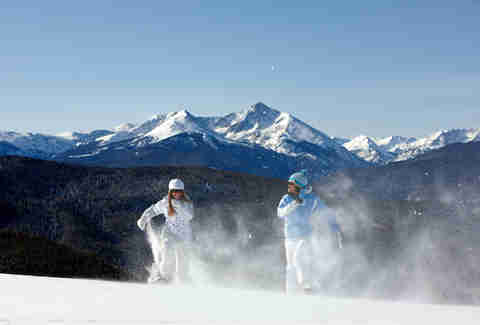 ), free in-town buses, and easy access to the mountain -- makes it feel like the entire town is ski-in/ ski-out. 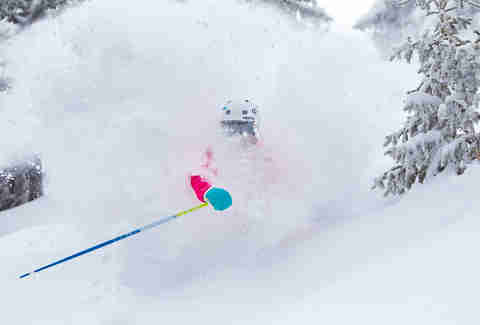 When to go: The Vail season usually begins mid-November and runs through mid-April. If you want to be a part of what's billed as "the largest early-season mountain bash in North America", then book your flight for Snow Daze -- it's going down December 9-15th. 1. At four miles, Riva Ridge on the Front Side is the longest run on the mountain. The difficulty level varies between blue and black, and there're great views all the way down. 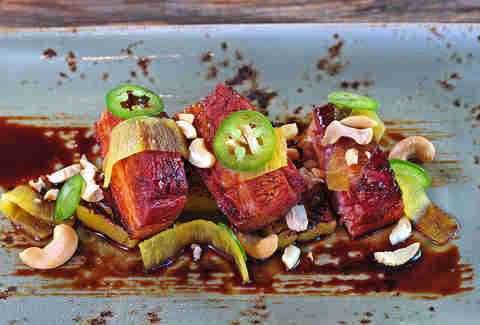 Dining: Vail's wealth of eateries means you don’t need to extend your après nosh into a full meal. Popular Mountain Standard's owned by the same folks behind well-loved Sweet Basil, and peddles food prepped over an open wood fire. Flame, an upscale steakhouse, highlights duck-fat fries and choice cuts like the 36oz “long bone” Tomahawk. Or, if mountain eating makes you crave fondue, score a table at the Swiss Chalet. 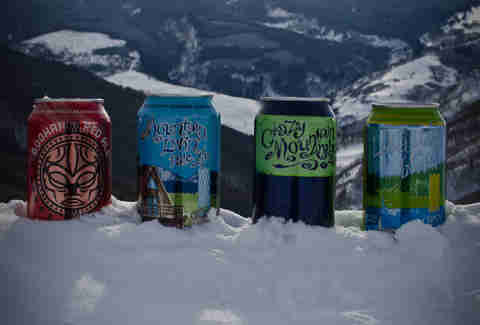 Local brews: Head to nearby Edwards to visit the tasting room at Crazy Mountain Brewing Company, where they're pouring choice offerings like the Hookiebobb IPA, Snowcat Coffee Stout, and the aforementioned 10% ABV barley wine dubbed Lawyers, Guns & Money. If you’re apt to indulge in a spa day (just throwing it out there), the Brew and Renew treatments at the Four Seasons Resort and Residences Vail incorporate said Crazy Mountain beer in scrubs, wraps, scalp treatments, and foot soaks. The Bonfire Brewing Company taproom in Eagle also rocks a solid assemblage of craft suds, including a Firestarter IPA, Brush Creek Blonde Ale, and Dark Helmet Schwarzbier. Après: Skiers looking for a slope-side perch with a sense of drama choose Los Amigos, where they can enjoy margs and nachos while watching late-afternoon skiers navigate Pepi’s Face. The deck at Garfinkel's is another solid spot for some late-day outdoor imbibing. Others prefer a slice of Snow Pig pizza and brews at Vendetta’s. Want a quieter scene? Stay on-mountain at The 10th, and enjoy a tasty cocktail fireside. Nightlife: Ease into things with beers at Bart & Yeti’s, or a cocktail at the Frost Bar. After catching your second wind, kick the night into high gear with some live tunes at The Red Lion, a traditional ski bar with microbrews and warm mountain libations. At Whiskey Jack’s, expect shot specials and a pumping sound system that encourages dancing, not to mention shouting -- at least if you want to hear your crew. 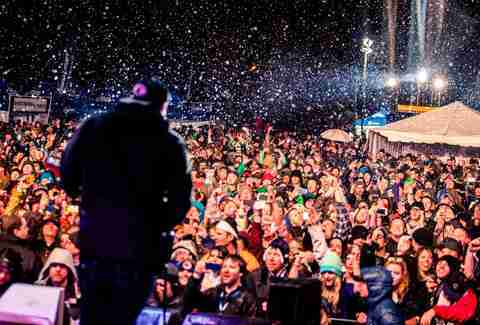 Finally, be sure to check the Vail events calendar as frequent festivals usually spill out into the village streets. And that's fun you don't want to miss.